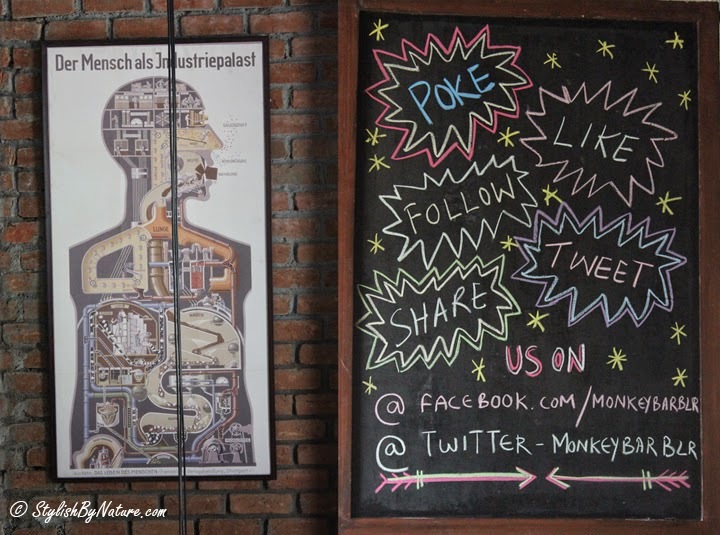 It was a lazy Saturday afternoon when we decided to visit Monkey Bar for Lunch. Being conveniently located in Indiranagar it is easily accessible gastro pub, you don't have to drive to the end of city to have gastronomic delight. They have an extensive food menu, its not stuck to particular cuisine, Chef has tweaked food inspired by different cuisines and given them their own twist which is magical. This a place where Galouti kabab can share its space with Tortillas. You have to be here to experience it..
Their Beef Burgers need a special mention, they are one of the best I have had lately. When visiting this place you have to try their Death Sauces, I tried it with just a laugh, but it can truely burn your a** off..
Monkey bar does equal justice to Drinks menu, they have variety of drinks in menu apart from the conventional ones. Special Mention - In this bad heat "Maanga" deserves a mention, its a vodka, aam panna, sweet lime, mint and jeera cocktail, this is just perfect. To add to excitement they serve it in Nutella jars, which is unconventional but cute. Monkey Bar is a place where Gastrology and Mixology share space in Harmony.